You could be excused for believing there’s no new ground for Starbucks to break in the U.S. The Seattle-based coffee chain has around 14,000 outlets spread across the country. Sadly, you are wrong. You just need to open your mind, and start imagining coffee shops in places more known for their extraordinary natural beauty than their foot traffic. Take California’s Yosemite, where a new Starbucks opened earlier this month—the first in a national park. It’s likely Starbucks wanted in on the crowds, which have caused the park to become absolutely gridlocked in recent summers. But the development is also in line with a newfound push to privatize some public park services, something Interior Secretary Ryan Zinke and President Trump are on board with, in a hope that it will help mitigate the Park Service’s perpetual budget woes. According to a report from The Center for American Progress last year, “corporate interests have been steadily attacking and whittling away at that idea” that America’s national parks should be owned by and managed for the benefit of all Americans. The report found that “concessionaires are quietly reaping the benefits of operating in national parks without fully absorbing the costs,” and that the government routinely uses taxpayer money to pay for maintenance on infrastructure that the businesses profit from. 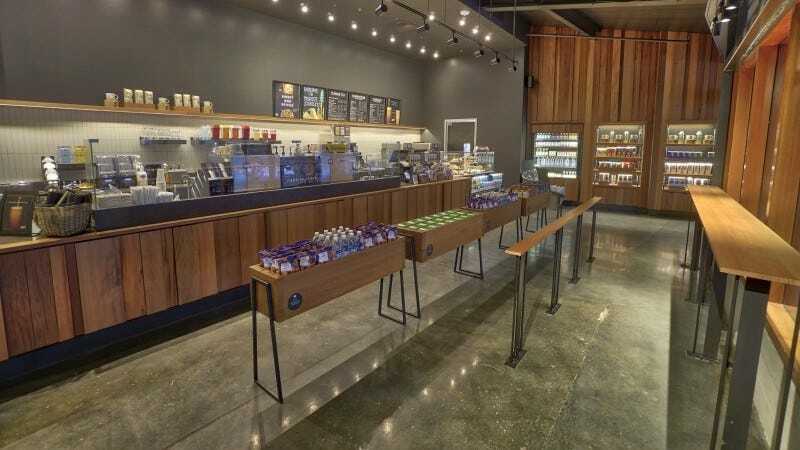 In announcing the opening of the Starbucks, the company, which at least purports to take the environmental impact of its business seriously and has a history of green building, was eager to pitch the shop as a new attraction rather than a necessary evil. According to a press release, the one-of-a-kind Starbucks is a LEED-certified “gem” that inhabits the spirit of its location. It’s clad in “reclaimed and rediscovered” redwood and has lights featuring exposed wood grain textures. Perhaps sensitive to the controversy surrounding its existence, the coffee shop also features a distinct lack of Starbucks signage. The exterior of the new Yosemite Starbucks. The shop is not a standalone structure, but part of a remodeled food court in one of the parks’ mid-century lodges. The Park Service has granted multinational, Philadelphia-based Aramark a 15-year contract to operate hotel and food concessions inside the park, and the company will oversee the cafe using Starbucks’ logo and products. This might all be a little more palatable if Zinke wasn’t also set on hiking national park admissions fees to help pay off the maintenance backlog. The fees, which would be implemented at the most popular parks during peak seasons, would generate an estimated $70 million annually, a small fraction of the Park Service’s $11.3 billion maintenance backlog. Perhaps the cost of entrance could include a free cup of coffee? Now that would be something worth waiting in line for.